Members of Oxford University Yacht Club have completed one of the toughest offshore races in the world: the Sevenstar Round Britain and Ireland Race. The race covered 1,805 nautical miles and took the Oxford crew just over 13 days to complete. The crew finished at 1:30pm on Saturday 25th August, where they were met at the race’s start and finish point of Cowes, Isle of Wright, by family and friends. A similar distance to a transatlantic crossing but with more tidal challenges, the Sevenstar Round Britain and Ireland Race was a difficult challenge for the team. The crews faced the tail-end of a tropical storm, oil rigs in the North Sea and busy shipping lanes on their journey. Oxford captain Sean Linsdall remarked: “I think we all went in rather naively, expecting it to be bad, but not really knowing what bad weather meant… I think the worst night we had was last night (before we arrived on Saturday). 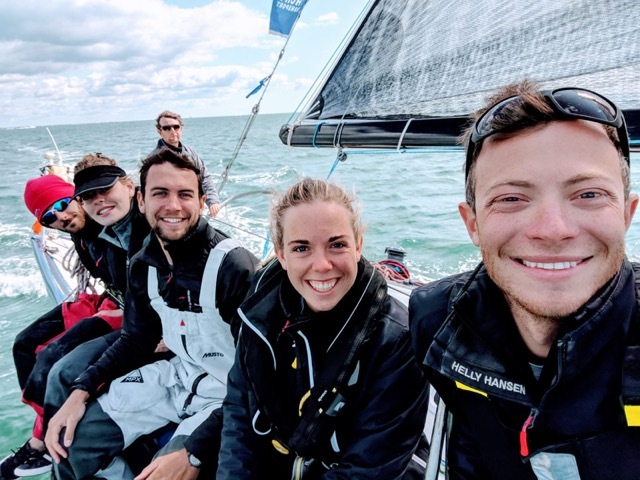 It was force 7 off Beachy Head, tide against us, we’d just shredded the main for the second time and we weren’t really making any progress and that was demoralising.” Although ten boats retired from the race, the Oxford crew persevered until the end. After this outstanding achievement at such a young age, the future looks bright for the Oxford University Yacht Club crew.